- Publisher Deckhead: The revised edition of a classic in Christian education^Originally written in 1976, this classic critique of Christian education is back in a revised edition. Christian education, according to Westerhoff, has modelled itself on the schooling-instructional paradigm of our secular schools. Instead of expecting faith formation to happen within a variety of contexts -- the family, church, school, and the church school -- religious education has been relegated entirely to Sunday morning classes. There children learn the facts about religion, but will they learn or experience faith? How can we be communities that nourish and nurture the faith of children, instead of only teaching them facts?^This revised edition includes a new foreword that summarizes Westerhoff's own faith journey that led him to write this book, and even to rethink portions of it today. Each of the original chapters concludes with notes that reveal some of Westerhoff's rethinking of the material since 1976. A new Afterword explores the context in which we live currently, and its implications for catechetical ministry. - Publisher This classic title challenges all of us to rethink how we pass on our faithnot just our religious factsto our children. Updates at the end of each chapter and a new afterword deal not only with societal changes but also with the authors personal reflections. 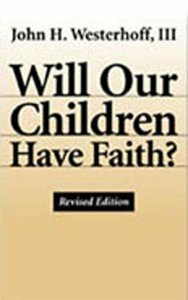 About "Will Our Children Have Faith? (& Expanded)"
Deckhead: The revised edition of a classic in Christian education^Originally written in 1976, this classic critique of Christian education is back in a revised edition. Christian education, according to Westerhoff, has modelled itself on the schooling-instructional paradigm of our secular schools. Instead of expecting faith formation to happen within a variety of contexts -- the family, church, school, and the church school -- religious education has been relegated entirely to Sunday morning classes. There children learn the facts about religion, but will they learn or experience faith? How can we be communities that nourish and nurture the faith of children, instead of only teaching them facts?^This revised edition includes a new foreword that summarizes Westerhoff's own faith journey that led him to write this book, and even to rethink portions of it today. Each of the original chapters concludes with notes that reveal some of Westerhoff's rethinking of the material since 1976. A new Afterword explores the context in which we live currently, and its implications for catechetical ministry. This classic title challenges all of us to rethink how we pass on our faithnot just our religious factsto our children. Updates at the end of each chapter and a new afterword deal not only with societal changes but also with the authors personal reflections. Westerhoff was Professor of Theology and Christian Nurture at Duke University Divinity School for 20 years, and is now founding director of the Institute for Pastoral Studies at St. Luke's Episcopal Church in Atlanta, GA.